Clayton Davis is the esteemed Editor and Owner of AwardsCircuit.com. Born in Bronx, NY to a Puerto Rican mother and Black father, he’s been criticizing film and television for over a decade. He's also an active member of New York Film Critics Online, and the IPA. 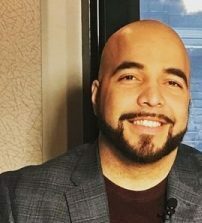 He has been quoted and appeared in various outlets including the New York Times, CNN.com, Bloomberg Television, AOL, Huffington Post, Bloomberg Radio, The Wrap, Slash Film, and the Hollywood Reporter.